Born in 1956, Mike Naughton grew up in the Roseland community on the south side of Chicago. He and his wife, Linda, were married in 1979 and moved to Manhattan, Illinois in 1986. In 1989, Mike was elected Mayor of the then booming-metropolis of 1800 people, and was elected to Village Trustee in 1994 (a position he has held ever since). He has operated his private law practice in Manhattan for 30 years. 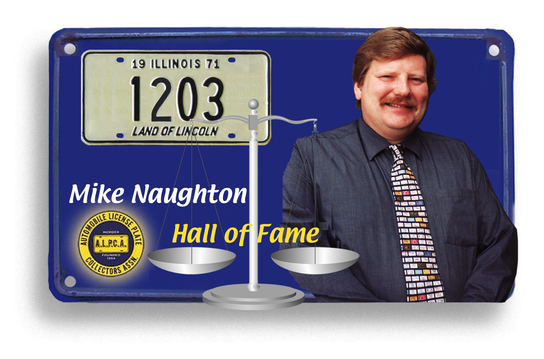 Perhaps the best description written about Mike is that he is a license plate collector who also happens to be an attorney. He discovered ALPCA from Frank Basco (#952) who worked with his father at Commonwealth Edison. Mike would pick up any spare plates he could, from anywhere he could, often hanging them on the walls of his father's garage. Two of the greater contributors to (or rather, enablers) of young Mike's collection were Tom Baur #2172 and Barney Schukraft #240. Barney was Mike's greatest mentor in collecting, making, in Barney's own words, a "snot-nosed kid" into one of the greatest collectors of early Illinois license plates. He joined the club in 1971 and has been the consummate volunteer ever since. He was club President from 2001-2005, Vice President from 2011-2013, and is in his third discontinuous stint as Director having served from 1982-1985, 2007-2011 and was elected again in 2014 with a term that runs until 2016. Not content with that, Mike was appointed club legal counsel in 2014. Previously he volunteered as awards chairman, complaint chairman, and convention chairman. Anyone who has attended a National convention also knows he has served as auctioneer until his voice gives out or we run out of plates to sell - whichever comes first. Mike was also a co-founder and past president of the MAPA region. He has hosted or co-hosted more than fifty meets since 1975. Plate collecting is a family affair for the Naughton clan: his wife Linda, children Bailey and Zacke, and granddaughter Evelyn are all dues paying members. All are active in their community, their church and their schools. He enjoys collecting all states, all years, but his main focus is low numbers, early Illinois, and elected official plates. His Illinois collection includes many pre-states and special event plates. One of his prized items in special events is a 1935 American Legion plate. Making friends in this unusual hobby is the ultimate high, and Mike, who has been to every convention since 1976, numbers hundreds of life-long friends. Countless members were laudatory in their praise of Mike for all that he has done for ALPCA over the last 44 years. It is with pride that we welcome Mike Naughton to the ALPCA Hall of Fame. He has paid his dues and this honor fits the man. He epitomizes the spirit of fraternity that this club is all about.